^ 1.0 1.1 About Vimeo. Vimeo. [2010-08-04]. ^ Vimeo.com, Site Info from Alexa. Alexa. [2010-06-16]. ^ How do I pronounce Vimeo? in Vimeo FAQs. Vimeo.net. [18 November 2013]. ^ 4.0 4.1 Uploading rules. ^ Community guidelines. Vimeo. [2008-09-08]. ^ Darren Murph. Vimeo now hosting one million videos, 10% in HD. 2008-09-17 [2009-12-10]. ^ Introducing 1080p playback and AVCHD support!. Vimeo Staff Blog. 2010-01-29. ^ Annoyed with Vimeo Plus! in the Vimeo General Discussion Forum. 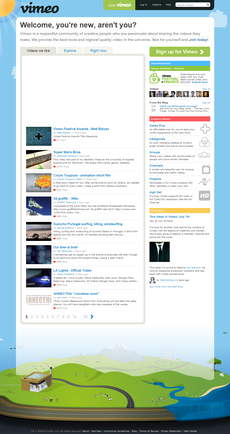 ^ Top 10 Video Sharing Sites Judged by Mashable Readers. Mashable. Barb Dybwad. ^ Vimeo now blocked in China: The Great Firewall strikes again!. shanghaiist.com. Cary Hooper. 2009-10-15.